Helen Watson (1860s-1946) was the daughter of an army chaplain whose work took his family to many parts of the British Empire. Born in Edinburgh in the 1860's, Helen went to live in Madeira when she was two, was taught by her father until age ten, and then sent back to Scotland to be educated. In 1889 Helen Watson married William Bannerman, a surgeon in the Indian medical service of the British army, with whom she she lived in India for the next 30 years. In 1898 after a trip to visit her two daughters who being educated in Scotland, she wrote a "picture letter" to her daughters to while away the tedium of the journey and, as she said, to comfort herself for the absence of her family. Friends persuaded her to have the story published. 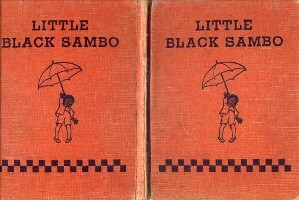 Small in size, "because as a child, she had always wanted a book she could hold in her own tiny hands," Little Black Sambo has remained popular ever since. She was about 83 when she died on October 13, 1946. 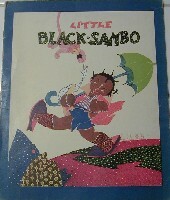 Little Black Sambo: you know the story. Despite all the debates circulating around it, it is still very popular, both with collectors of vintage Black memorabilia, as well as those who just remember liking the story when they were kids. There's even a Little Golden Book version that seems to strike many memory chords. 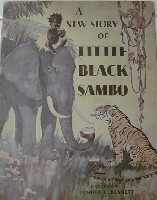 *The Story of Little Black Sambo. NY: Stokes, 1900. The Story of Little Black Mingo. NY: Stokes, 1902. 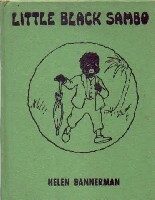 The Story of Little Black Quibba. NY: Stokes, 1903. The Story of Little Kettlehead. NY: Stokes, 1903. Pat and the Spider. London: Nisbet, 1905. The Story of the Teasing Monkey. NY: Stokes, 1907. The Story of Little Black Quasha. NY: Stokes, 1908. The Story of Little Black Bobtail. NY: Stokes, 1909. 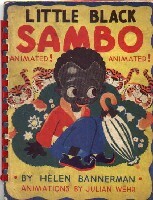 The Story of Sambo and the Twins. NY: Stokes, 1936. Peat, Fern Bisel. American Crayon, 1943. Thurston, Clara Bell. Whitman, 1926. Wiese, Kurt. Garden City, 1933. Lester, Julius. 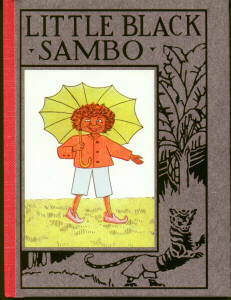 Sam and the Tigers: A New Telling of Little Black Sambo. Illustrated by Jerry Pinkney. Dial Books, 1996.